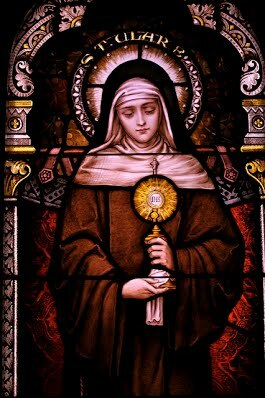 August 11 - Saint Clare, Virgin - Memorial - My Catholic Life! Silicon Valley is not, topographically, a valley. The name is a contrivance dating from the 1970s and 80s. The actual valley is named after today’s saint. Santa Clara Valley, running southeast from the southern shores of San Francisco Bay, was named after its beating heart, Mission Santa Clara de Asís – a church, school, and farm – founded by Franciscan Friars in 1777. The current mission church, a beautiful twentieth century idealization of mission architecture, sits on the site of the original Mission structure and is the iconic campus centerpiece of Santa Clara University, California’s oldest. It’s likely that Saint Clare never left her convent in Assisi, Italy, for the last forty years of her life. Yet a valley, city, and university in far away California are named in her honor. That a medieval, cloistered, Catholic nun is still so present to a hyper-modern portion of the world is a testament to the global reach and cultural impact of Catholicism and the Franciscan order. Clare of Assisi was born about a decade after and in the same small town as Saint Francis. Many of Clare’s earliest friends became nuns in her community, survived her, and gave testimony in her canonization process, reporting interesting details about her early life. Clare was from an economically comfortable family in the upper part of Assisi, in the neighborhood of the nobility. She had two younger sisters. Her mother was pious and had gone on long pilgrimages to holy shrines. Her household included knights and soldiers. From an early age she was interested in religious life, and gave religious instruction to the many servants and others in her vast household. Clare was a prize to her father, as eligible daughters were like pawns whose marriages could seal alliances with other noble families. An Assisi marriage broker testified, after Clare’s death, that he had approached Clare various times with offers of marriage from interested suitors. She turned him down each time, and instead challenged the broker about the quality of his own Christian commitment. If Clare had never met Saint Francis, she may well have become a Benedictine nun in a convent for noble women, putting her education to good use in the reproduction of sacred manuscripts. But she did meet Saint Francis, so her natural religiosity turned more radical. At the age of eighteen, Clare heard Francis preach in a local church and was deeply moved, as so many were, by his presence as much as his words. She began to meet with him privately to talk about the things of God and a new plan for her life. On Palm Sunday in Assisi, there was a tradition that eligible young ladies would process down the aisle of the Cathedral to receive a blessed palm branch from the Bishop’s own hands. Interested local bachelors showed up to watch this kind of sacred debutante parade. Clare was in the Cathedral on Palm Sunday 1212, but she did not process with all the others. Instead, the Bishop, known to history as Guido, descended the sanctuary steps and extended a palm to her as she remained in her pew. Christ would be her spouse. Her plan was about to unfold. That very night, Palm Sunday 1212, Clare secretly fled her family home and, with Francis’ help, entered behind the barred doors of a local convent. She donned a rough habit and her hair was shorn. The men in her family were alarmed and rushed to bring her home and to her senses. Clare would not budge. She tore the linens from the altar as they tried to drag her out of the chapel. They finally recognized the law of sanctuary and retreated. Clare never deviated from the path she chose that Palm Sunday night. Her close, holy relationship with Francis would endure until his death. He was the leader, the giver, the essential figure. She provided support and allegiance. Clare would go on to become the first woman to write a rule for other women. She became the foundress of all female Franciscan religious, who number in the tens of thousands today. She had an iron will, a great capacity for physical suffering, and lived a cloistered life of intense and continual prayer. For Clare and her spiritual progeny, the Poor Clares, religion was not primarily an internal disposition. Religion cannot be reduced to mere feelings, pious thoughts, or holy words. It is not a truly great and religious thing to separate the paper from the plastic in the recycle bin. It is a truly great and religious thing to go barefoot, to fast, to abstain from meat, to remain chaste, to wear a coarse habit against the skin, to pray long hours on your knees, to sleep on the floor, and to spend the night shivering in the cold. Such a life is for the few. But there are such few in the world, even today. Of their lives, nothing is counterfeit. Saint Clare of Assisi, you chose a radical form of love of God as a cloistered nun. May your example and your prayers inspire all Catholics, especially female religious, to organize their entire lives around God, His Son, and His Church. ON Palm Sunday, March 17, 1212, the Bishop of Assisi left the altar to present a palm to a noble maiden, eighteen years of age, whom bashfulness had detained in her place. This maiden was St. Clare. Already she had learnt from St. Francis to hate the world, and was secretly resolved to live for God alone. The same night she escaped, with one companion, to the Church of the Portiuncula, where she was met by St. Francis and his brethren. At the altar of Our Lady, St. Francis cut off her hair, clothed her in his habit of penance, a piece of sack-cloth, with his cord as a girdle. Thus she was espoused to Christ. In a miserable house outside Assisi she founded her Order, and was joined by her sister, fourteen years of age, and afterwards by her mother and other noble ladies. They went barefoot, observed perpetual abstinence, constant silence, and perfect poverty. While the Saracen army of Frederick II. was ravaging the valley of Spoleto, a body of infidels advanced to assault St. Clare’s convent, which stood outside Assisi. The Saint caused the Blessed Sacrament to be placed in a monstrance, above the gate of the monastery facing the enemy, and kneeling before it, prayed, “Deliver not to beasts, O Lord, the souls of those who confess to Thee.” A voice from the Host replied, “My protection will never fail you.” A sudden panic seized the infidel host, which took to flight, and the Saint’s convent was spared. During her illness of twenty-eight years the Holy Eucharist was her only support and spinning linen for the altar the one work of her hands. She died in 1253, as the Passion was being read, and Our Lady and the angels conducted her to glory.